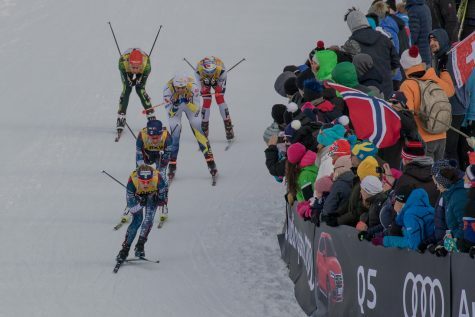 World Cup period one racing just…flew right by! How does that happen? Racing every weekend, I just slip into the strange but weirdly predictable World Cup rhythm. Travel Monday. Train tuesday (usually intervals and strength). Distance training wednesday and thursday. 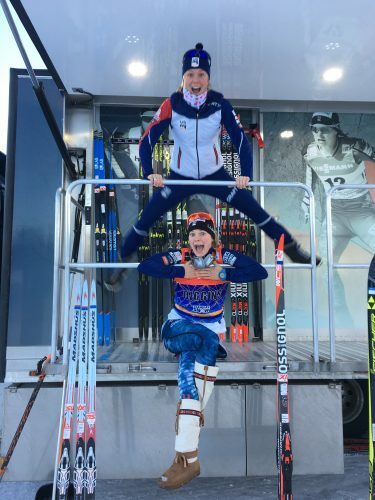 Friday is race prep; testing skis with my tech, doing some intensity with the girls, scouting out the course. Then racing my brains out Saturday and Sunday! That’s the part I love. We really jumped right into it this year after a week of adjusting to the time zone (or rather, trying really hard to adjust but inevitably waking up at 3am to read for a few hours while convincing yourself that sleep is super overrated). We spent this week in Rovaniemi, Finland, but really it’s Santa’s town. You can’t fly in and out of that place without seeing all the signs directing you to Santa’s village on the Arctic Circle. Because I love playing tourist, we went to check it out! Since it was just me and half of our wax techs, we skipped the part where we sat on Santas lap. I’ve regretted it since. Sadie and I, pretty stoked on this new wax truck situation. 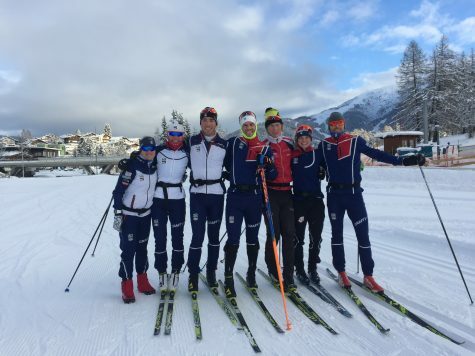 The World Cup season opened with a mini-tour in Ruka/Kuusamo Finland. All these years later and I’m honestly still not sure if I’m supposed to call it Ruka, or Kuusamo! You’ll have to forgive me. But either way, that course is basically a giant half-pipe for cross country skiers. You drop down out of the stadium and ski up a massive hill, turn it around and fly down the other side before climbing the wall back into the stadium. It takes a lot of the finesse and strategy out of the race and turns it into a pretty straightforward grind, which makes it a pretty shocking wake-up to racing! 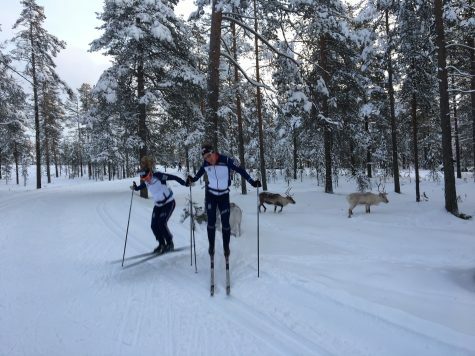 Personally, I think the whole World Cup gets a big fitness boost after that triple race weekend. But this theory may be based on the fact that it’s a long walk up the mountain to get to every meal. Either way, I feel like Ruka is always a good and much needed shock to my system and prepares me for the year. Wax techs Cork and JP hard at work in our new wax truck! The travel days from venue to venue are not as glamorous or smooth as I liked to imagine they were when I pictured the World Cup. Ruka to Lillehammer was a cool 5am wakeup and bus ride to the airport where I was informed with a wide grin that my seat had been given up by our travel agency (it most certainly had not). These are the really fun moments, when you find out that you would normally panic and die inside a little bit (“my team is going without me! Help! I’m going to get left behind!”) but you’re just too sleepy and tired to react much. Luckily for me our head coach Grover is good at ironing out these bumps in the road. Still, only after a 100 person line had formed behind us with at least 80% of those people glaring at the back of my head was I allowed on the plane. You know that feeling you have when someone is watching you? Your skin prickles and it’s really awkward? Imagine this while being the cause of a one-room airport check-in line hold up. Exciting times, I tell you! Don’t get me wrong, sometimes it feels a little bit glamorous. Sometimes, there are autograph collectors waiting for you in the airport which makes you simultaneously self-conscious of your unbrushed, greasy hair after a long flight and also astonished – and worried – that someone has your travel plans memorized. But holy cow, someone thinks your name is worth at least 30 Euro cents on ebay! Full disclosure; Andy Newell’s name is worth 40% more than my name. And rightly so. But both of us are worth less than 2 Euros. We googled it one time and figured it out, then high-fived about the fact that our autographs are worth less than the shipping costs it would take to get them. 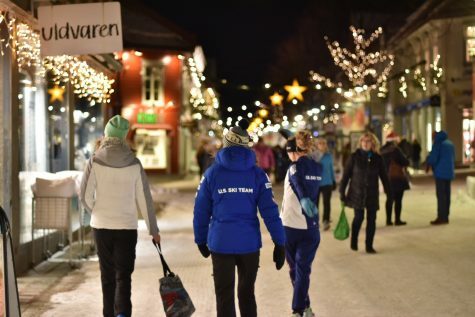 The week of Lillehammer was amazing – we had real snow to ski on outside of the race trails and I love, love, LOVED the tourist trails. The racing was awesome too! I get such a kick out of seeing so many fans camped out on the side of the trail, ready for a day of ski racing. 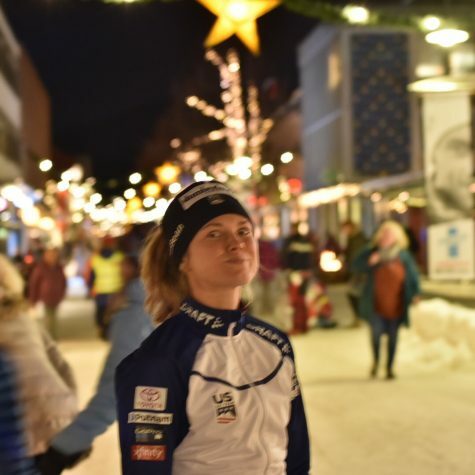 Unfortunately, I got a cold the Sunday of our second race in Lillehammer and, not recognizing the cold for what it was (hey, I thought my throat was scratched up from choking down bonfire smoke on the side of the race course during the sprint! How was I supposed to know?) I raced anyways and then felt pretty miserable for the next 3 days of being sick. As my friends in other sports like to tease me, we “Nordies” are real germ freaks when it comes to getting sick. With good reason, because even if you’re operating at 97% you won’t race nearly as fast as when you’re totally healthy. In a sport that demands absolutely everything you have over the course of the race, you can’t afford to have anything missing! 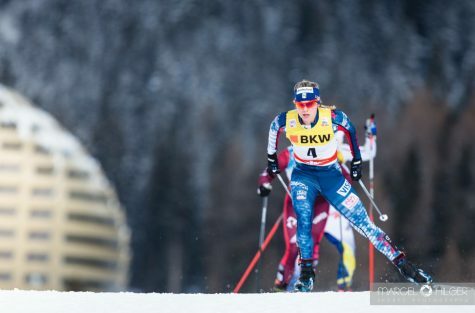 So I stayed far away from my teammates, sat out in the sunshine, drank WAY too much tea, and got better just in time to race the Davos weekend! Oh, and I went sledding. That never fails to make me laugh and feel better. I highly recommend it as a cure-all. 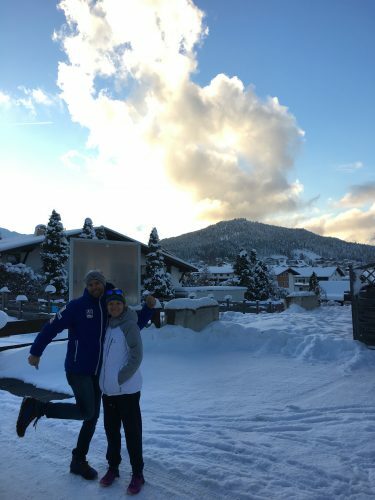 Sledding in Davos. And soaking up a ton of sun! 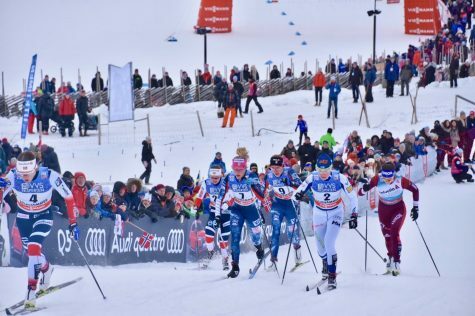 After racing hard in Davos, I felt like my body was totally empty. For the first time maybe ever, I simply couldn’t eat enough. I was hungry all the time! 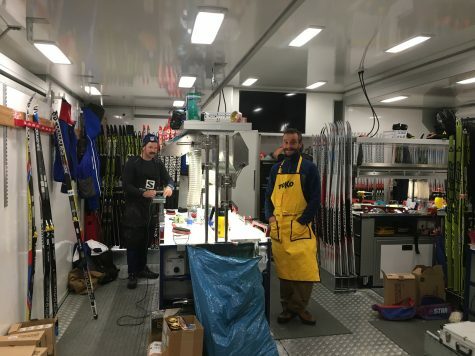 I found myself scrounging through my pockets an hour before our race in Toblach like a chipmunk looking for something to eat and came up with 2 week old stale gummies. Yes, I ate them, and yes, I was still trying to chew them 10 minutes later. But they did the trick! I was able to finish out period 1 of the World Cup with a solid weekend of racing (a pair of 7th place finishes) and ranked 6th in the World. 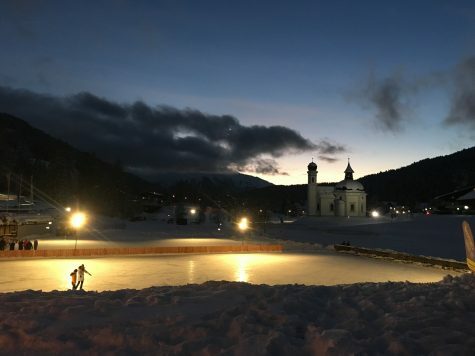 Toblach, where we get to race up and over a building! I just love that. I’m never sure what to say about racing because I tend to focus more on the effort I gave and how I mentally approached a race than the result I got at the end. I am, after all, much more complex than a number on a piece of paper (or your iPhone, since this is the digital age). 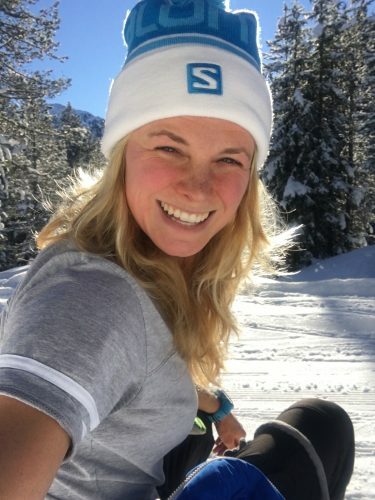 But the thing that I was most proud of during Period 1 was my classic skiing, because I’ve been working so hard for so long to bring it up to the level of my skating. 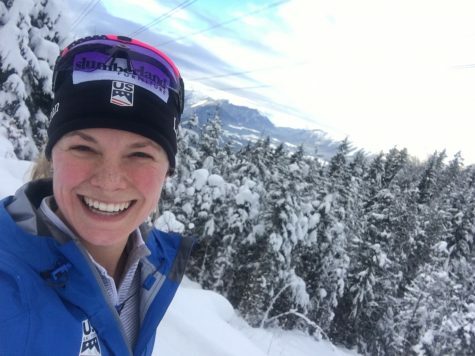 I felt confident in tricky wax days and went out swinging hard, and for a most of those races, I really connected with how I wanted to feel striding up the hills, with power and spark. I was also happy with my mental patience. I’m focusing, like pretty much everyone I know, on the Olympics for my peak of the season. At this stage in my racing career, I really only get one big peak and I’d like to make it a good one. So throughout the start of the year I’ve been feeling in good shape but still missing that last gear, that tiny little spark that I have when I’m really on my game and in my best race form. And (deep breath) that’s OK. It’s hard to purposefully not be in my best shape, but I’m hoping it will pay off later. At least, that’s the plan! 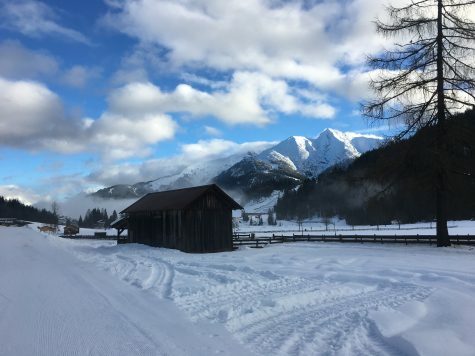 Some incredible skiing and views in Seefeld! After 9 races it was time for a break! 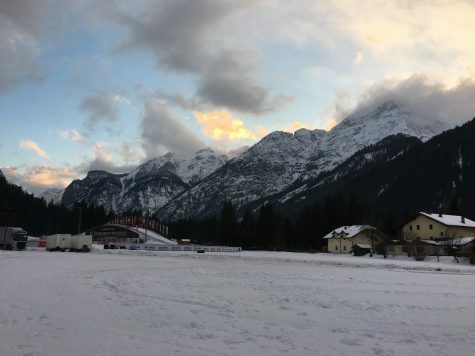 So we packed up, left Toblach and drove to Seefeld, Austria for our Christmas training camp. Oh wow, Seefeld. I could go on and on and ON about how much I love this gorgeous little town in the mountains. Every direction you turn, there are amazing views, and there must be over 100km of trails if you’re ready to go ski them all. Liz, Andy and I rented a little cabin that was aptly named “Cozy Romantic Tyrolean Cottage”. It’s super cute, and every day we go eat our lunch on the deck in the sun, faces turned up to get as many freckles on my nose as humanly possible. Don’t worry Mom, I remembered my sunscreen! 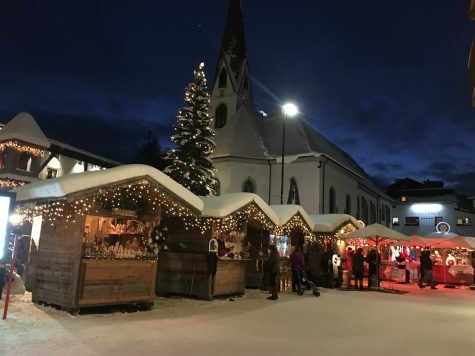 Seefeld at night! This is the edge of the XC ski trails. Part of our Holiday camp crew! While it’s never easy to be away from your family during the Holidays, I feel incredibly lucky to have my ski family here, whom I also love very much. These amazing men and women have become my older sisters and brothers, and I am so happy to get to be with them! They also put up with my excessive cookie baking, carol-humming and general over-optimism about how many activities we’ll get to pack into one day. Liz and Andy, my awesome housemates! And soon, on the 30th, it’s time for the 9 day adrenaline rush that is more formally known as the Tour de Ski! This year it’s 3 venues, 7 races in 9 days across Switzerland, Germany and Italy. During the Tour the highs are high and the lows are low, but it’s always a really fun event because we get to do what we love most every day – race! 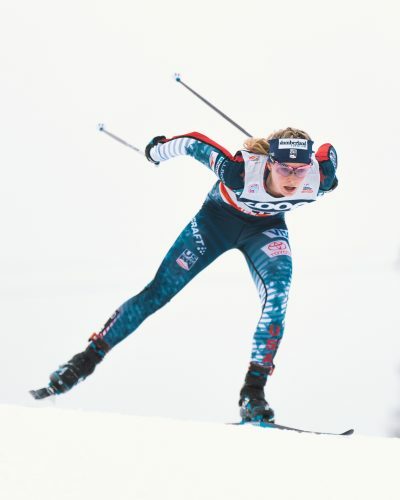 I feel like I learn so much every year from having the chance to race so many times, and I also get an awesome fitness boost when I’m done as long as I take the time to let my body recover and bounce back! So wish us luck, and enjoy the Holiday Season!